“In 2011, immediately after the Avendale vote, which removed 180 acres from the Rural Crescent, Supervisors unanimously approved Chairman Stewart’s motion to “reaffirm” the Board’s support for the Rural Crescent, as established in the 1998 Comprehensive Plan. “On March 20, the board will again vote on a proposal to remove 300 additional acres from the Rural Crescent, Mid-County Park and Estate Homes. I am hopeful supervisors will honor their reaffirmation to the Rural Crescent and vote to deny initiation of this Comprehensive Plan Amendment (CPA). It certainly doesn’t make sense to continue to allow encroachment into the Rural Crescent while ‘reaffirming’ your ‘commitment’ afterwards! “What is unique about this CPA by Mark Granville-Smith is, well, nothing. Why should one developer get special treatment while other landowners in the Rural Crescent must build to the one-home-per-10-acre-lot standard? How are developers AND citizens to understand the rules in Prince William County if they are routinely changed on a whim? “To the best of my knowledge, once initiated, all but one Rural Crescent CPA has always passed. 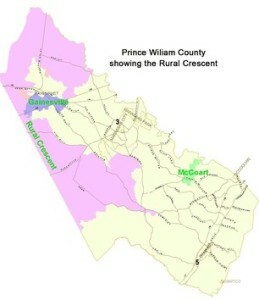 Greater South Market is the only CPA in the Rural Crescent that was denied. “Many citizens believe very strongly that no government resources, i.e. staff time, should be invested in CPAs that would change Rural Crescent boundaries. The tenets of why the Rural Crescent is critical to the fiscal health of the county are as true today as they were in 1998. There has been much talk lately of the tax rate, which is ultimately driven by the land use decisions of this board. Infrastructure isn’t free! “The Rural Crescent has proven to be an effective urban growth boundary that helps the county control sprawl and maximize the benefits of taxpayer-funded infrastructure investments. Anyone can look around and see that tax dollars are better invested in areas designated for development, not rural areas that require extensive and unnecessary infrastructure. “If supervisors believe the value of the Rural Crescent is no longer relevant, then I urge the board to have that discussion in the light of day, not by dismantling the Rural Crescent piece by piece by piece. Let’s have an open and honest debate based on the facts. “Allowing this CPA to move forward would be an abdication of the critical role this board plays in planning and budget processes. Supervisors have previously denied the Mid-County CPA twice, in 2006 and 2009. I urge them to continue to demonstrate fiscal responsibility and vote NO to initiate the Mid-County CPA.